A calculator is a device for performing calculations. Modern calculators often incorporate a general-purpose computing system, but they are often designed to perform specific operations. For example, graphing calculators focus on graph-centered math such as trigonometry and statistics. 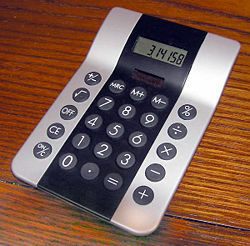 Also, modern calculators are more portable than most computers, though some personal digital assistants (PDAs) are comparable in size to hand held calculators. As calculators are miniaturized, someday devices that are as small as credit cards may perform the same calculations as today's large scientific calculators. Another possible advance may be similar to a handheld computer, where the notations are not entered by buttons but are written on a screen. With this development, the need for buttons would be eliminated and the size of the device would be further reduced. In the past, mechanical clerical aids such as abaci, comptometers, Napier's bones, books of mathematical tables, slide rules, or mechanical adding machines were used for numeric work. The word "calculator" denoted a person who did such work for a living using such aids as well as pen and paper. This semi-manual process of calculation was tedious and error-prone. Modern calculators are electrically powered and come in countless shapes and sizes varying from cheap, give-away, credit-card sized models to more sturdy adding machine—like models with built-in printers. In the past, some calculators were as large as today's computers. The first mechanical calculators were mechanical desktop devices, which were soon replaced by electromechanical desktop calculators, and then by electronic devices using first thermionic valves, then transistors, then hard-wired integrated circuit logic. Today, most calculators are hand held microelectronic devices. Other basic functions, such as square root and percentage (%). More advanced models may have a single-number memory, which can be recalled where necessary. It might also have a Cancel Entry button, to clear the current numbers being entered. Since the late 1980s, simple calculators have been installed in other small devices, such as mobile phones, pagers, or wrist watches. More complex scientific calculators support trigonometric, statistical, and other mathematical functions. The most advanced modern calculators can display graphics, and include features of computer algebra systems. They are also programmable; calculator applications include algebraic equation solvers, financial models, and even games. Most calculators of this type can print numbers up to ten digits or decimal places in full on the screen. Scientific notation is used to notate numbers up to 9.999999999*1099. If a larger number or a mathematical expression yielding a larger number than this is entered (a common example comes from typing "100! ", read as "100 factorial") then the calculator will simply display "error." "Error" is also displayed if a function or an operation is undefined mathematically; for example, division by zero or even roots of negative numbers (most scientific calculators do not allow complex numbers, though a few expensive ones have a special function for working with them). Some, but not most, calculators do distinguish between these two types of "error," though when they do, it is not easy for the user to understand because they are usually given as "error 1" or "error 2." 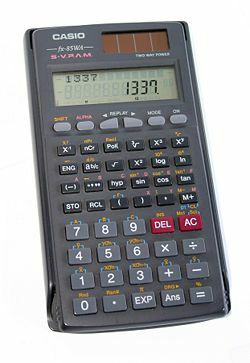 Only a few companies develop and make modern professional engineering and finance calculators: The most well-known are Casio, Sharp, Hewlett-Packard (HP), and Texas Instruments (TI). Such calculators are good examples of embedded systems. 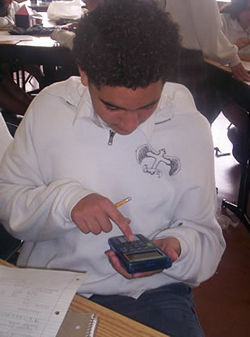 A student using a calculator. In most developed countries, students use calculators for schoolwork. There was some initial resistance to the idea out of fear that basic arithmetic skills would suffer. There remains disagreement about the importance of the ability to perform calculations by hand or "in the head," with some curricula restricting calculator use until a certain level of proficiency has been obtained, while others concentrate more on teaching estimation techniques and problem-solving. There are other concerns—for example, that a pupil could use the calculator in the wrong fashion but believe the answer because that was the result given by the calculator. Teachers try to combat this by encouraging the student to make an estimate of the result manually and ensuring it roughly agrees with the calculated result. Also, it is possible for a child to type in −1 × −1 and obtain the correct answer, 1, without realizing the principle involved. In this sense, the calculator becomes a crutch rather than a learning tool, and it can slow down students in exam conditions as they check even the most trivial result on a calculator. Errors are not restricted to school pupils. Any user could carelessly rely on the calculator's output without double-checking the magnitude of the result—i.e., where the decimal point is positioned. This problem was all but nonexistent in the era of slide rules and pencil-and-paper calculations, when the task of establishing the magnitudes of results had to be done by the user. Some fractions such as ⅔ are awkward to display on a calculator display as they are usually rounded to 0.66666667. Also, some fractions such as 0.14285714… can be difficult to recognize in decimal form—in fact, this number is 1/7. Some of the more advanced scientific calculators are able to work in vulgar fractions, although the operation in practice is somewhat awkward. A fundamental difference between calculators and most computers is that calculators are numeric tools only, while computers may use numbers to directly manipulate words, images, or sounds, for example. The market for calculators is extremely price-sensitive; typically the user cares primarily about what is the least expensive model having a specific feature set, but does not care much about speed (since speed is primarily constrained by how fast the user can press the buttons). Thus designers of calculators strive to minimize the number of logic elements on the chip, not the number of clock cycles needed to do a computation. For instance, instead of a hardware multiplier, a calculator might implement floating point mathematics with code in ROM, and compute trigonometric functions with the CORDIC algorithm because CORDIC does not require floating-point. For similar reasons, bit-serial logic designs are more common in calculators whereas bit-parallel designs dominate general-purpose computers: A bit-serial design minimizes the chip complexity but takes many more clock cycles. Many programs exist for performing calculations, from simple calculator emulators, to scientific calculators such as Microsoft Calculator, to advanced spreadsheet programs such as Excel or OpenOffice.org Calc. Computer algebra programs such as Mathematica, Maple, or Matlab can handle advanced calculations. Online calculators such as the calculator feature of the Google search engine can perform calculations server-side. The first calculators were abacuses, and were often constructed as a wooden frame with beads sliding on wires. Abacuses were in use centuries before the adoption of the written Arabic numerals system and are still widely used by merchants and clerks in China and elsewhere. William Oughtred invented the slide rule in 1622, and it was revealed by his student Richard Delamain in 1630. Wilhelm Schickard built the first automatic calculator called the "Calculating Clock" in 1623. Some 20 years later, in 1643, French philosopher Blaise Pascal invented the calculation device later known as the Pascaline, which was used for taxes in France until 1799. The German philosopher G.W.v. Leibniz also produced a calculating machine. Charles Babbage developed the concept further, leading the way to programmable computers, but the machine he built was too heavy to be operable. From the 1930s through the 1960s, mechanical calculators dominated the desktop computing market (see History of computing hardware). Major suppliers in the U.S. included Friden, Monroe, and SCM/Marchant. These devices were motor-driven, and had movable carriages where results of calculations were displayed by dials. Nearly all keyboards were "full"—each digit that could be entered had its own column of nine keys, 1 through 9, plus a column-clear key, permitting entry of several digits at once. One could call this parallel entry, by way of contrast with ten-key serial entry that was commonplace in mechanical adding machines, and is now universal in electronic calculators. (Nearly all Friden calculators had a ten-key auxiliary keyboard for entering the multiplier when doing multiplication.) Full keyboards generally had ten columns, although some lower-cost machines had eight. 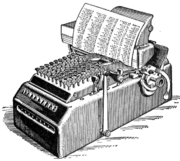 Most machines made by the three companies mentioned did not print their results, although other companies, such as Olivetti, did make printing calculators. In these machines, Addition and subtraction were performed in a single operation, as on a conventional adding machine, but multiplication and division were accomplished by repeated mechanical additions and subtractions. 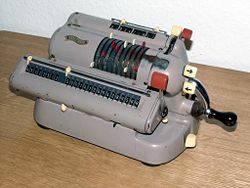 Friden made a calculator that also provided square roots, basically by doing division, but with added mechanism that automatically incremented the number in the keyboard in a systematic fashion. Friden was the only company that made a calculator with square root. 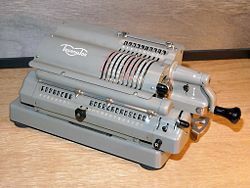 Handheld mechanical calculators such as the 1948 Curta continued to be used until they were displaced by electronic calculators in the 1970s. In 1954, IBM demonstrated a large all-transistor calculator and, in 1957, they released the first commercial all-transistor calculator (the IBM 608). In early 1961, the world's first all-electronic desktop calculator, the Bell Punch/Sumlock Comptometer ANITA (A New Inspiration To Arithmetic) Mk.VII was released. This British designed-and-built machine used vacuum tubes in its circuits and cold-cathode Nixie tubes for its display. This model was somewhat error-prone, and was replaced in September 1961, with the much more successful Mark VIII version. The ANITA had a full keyboard, and was, very likely, the only such electronic calculator. 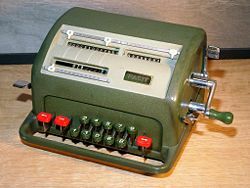 It was superseded technologically in June 1963, by the Friden EC-130, which had an all-transistor design, 13-digit capacity on a 5-inch CRT, and introduced reverse Polish notation (RPN) to the calculator market for a price of $2200, which was about triple the cost of an electromechanical calculator of the time. In 1964, Sharp introduced the CS-10A, also an all-transistor desktop calculator, which weighed 25 kg (55 lb) and cost 500,000 yen (~U.S.$2500). The Facit, Triumphator, and Walther calculators shown below are typical European machines. Similar-looking machines included the Odhner and Brunsviga, among others. Although these are operated by handcranks, there were, of course, motor-driven versions. Most machines that look like these use the Odhner mechanism, or variations of it. 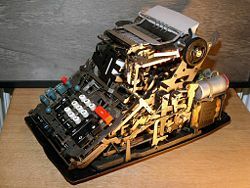 The Olivetti Divisumma did all four basic operations of arithmetic, and has a printer. Full-keyboard machines, including motor-driven ones, were also used in Europe for many decades. Some European machines, probably rare, had as many as 20 columns in their full keyboards. By the 1970s, the slide rule became obsolete and passed out of existence as the calculator of choice. In the early 1970s, the Monroe Epic programmable calculator came on the market. A large desk-top unit, with an attached floor-standing logic tower, it was capable of being programmed to perform many computer-like functions. However, the only branch instruction was an implied unconditional branch (GOTO) at the end of the operation stack, returning the program to its starting instruction. Thus, it was not possible to include any conditional branch (IF-THEN-ELSE) logic. During this era, the absence of the conditional branch was sometimes used to distinguish a programmable calculator from a computer. The first hand-held calculator, introduced in January, 1971, was the Sharp EL-8, also marketed as the Facit 1111. It weighed about one pound, had a vacuum fluorescent display, rechargeable NiCad batteries, and initially sold for $395. The first American-made pocket-sized calculator, the Bowmar 901B (popularly referred to as The Bowmar Brain), measuring 5.2×3.0×1.5 in (131×77×37 mm), came out in the fall of 1971, with four functions and an eight-digit red LED display, for $240, while in August 1972, the four-function Sinclair Executive became the first slimline pocket calculator measuring 5.4×2.2×0.35in (138×56×9mm) and weighing 2.5 oz (70g). It retailed for around $150 (GB£79). By the end of the decade, similar calculators were priced less than $10 (GB£5). The first Soviet-made pocket-sized calculator, the "Elektronika B3-04," was developed by the end of 1973, and sold at the beginning of 1974. The first low-cost calculator was the Sinclair Cambridge, launched in August 1973. It retailed for £29.95, or some £5 less in kit form. The Sinclair calculators were widely successful because they were far cheaper than the competition; however, their design was flawed and their accuracy in some functions was questionable. The scientific programmable models were particularly poor in this respect, with the programmability coming at a heavy price in transcendental accuracy. The first pocket calculator with scientific functions that could replace a slide rule was 1972's $395, HP-35 from Hewlett Packard (HP). Along with all later HP engineering calculators, it used reverse Polish notation (RPN), also called postfix notation. A calculation like "8 plus 5" is, using RPN, performed by pressing "8", "Enter↑", "5", and "+"; instead of the algebraic infix notation: "8", "+", "5", "=". The first Soviet scientific pocket-sized calculator, the "B3-18," was completed by the end of 1975. In 1973, Texas Instruments (TI) introduced the SR-10, (SR signifying slide rule) an algebraic entry pocket calculator, which was later followed by the SR-11 and eventually the TI-30. The first programmable pocket calculator was the HP-65, in 1974; it had a capacity of 100 instructions, and could store and retrieve programs with a built-in magnetic card reader. A year later the HP-25C introduced continuous memory, i.e. programs and data were retained in CMOS memory during power-off. In 1979, HP released the first alphanumeric, programmable, expandable calculator, the HP-41C. It could be expanded with RAM (memory) and ROM (software) modules, as well as peripherals like bar code readers, microcassette and floppy disk drives, paper-roll thermal printers, and miscellaneous communication interfaces (RS-232, HP-IL, HP-IB). The first Soviet programmable calculator "B3-21" was developed by the end of 1977 and sold at the beginning of 1978. The first calculator capable of symbolic computation was the HP-28, released in 1987. It was able to, for example, solve quadratic equations symbolically. The first graphing calculator was the Casio fx7000G, released in 1985. The two leading manufacturers, HP and TI, released increasingly feature-laden calculators during the 1980s and 1990s. At the turn of the millennium, the line between a graphing calculator and a PDA/handheld computer was not always clear, as some very advanced calculators such as the TI-89 and HP-49G could differentiate and integrate functions, run word processing and PIM software, and connect by wire or IR to other calculators/computers. In March 2002, HP announced that the company would no longer produce calculators, which was hard to fathom for some fans of the company's products; the HP-48 range in particular had an extremely loyal customer base. HP restarted their production of calculators in late 2003. The new models, however, reportedly didn't have the mechanical quality and sober design of HP's earlier calculators, for which HP calculators were once famous (instead featuring the more "youthful" look and feel of contemporary competing designs from TI). In the early days of the calculator, HP sales reps were famous for starting demonstrations by slamming the calculator on the floor. But today, calculators are regarded as cheap, disposable gadgets. The HP-12C financial calculator is still produced. It was introduced in 1981 and is still being made, with few changes. The HP 12c featured the reverse Polish notation mode of data entry. In 2003, several new models were released, including an improved version of the HP 12c, the "HP 12c platinum edition" which added more memory, more built-in functions, and the addition of the algebraic mode of data entry. Online calculators are programs designed to work just like a normal calculator does. Usually the keyboard (or the mouse clicking a virtual number pad) is used, but other means of input (e.g. slide bars) are possible. Many new types of calculators are possible thanks to the internet, for calculations that would be much more difficult without such aids (or not possible at all), such as for real time currency exchange rates, loan rates, and statistics. There have also been numerous calculators made by members of the general fanbase for various MMORPGs which typically allow players to determine the amount of experience points (EXP) needed to reach a specific level. For all intents and purposes, a calculator can be made for just about anything. In pocket calculators which only perform basic functions such as addition, subtraction, multiplication, and division, there are two additional "hidden" functions. Exponents and Reciprocal. To get exponents, enter the number desired to get exponents of, press the multiplication button, and press the equals button one time less than the exponent you wish to get. For example, 64 is [X][=][=][=]. To get the reciprocal, enter the number desired to get the reciprocal of, press the division key, and press equals. A TI-89 graphing calculator from Texas Instruments. U.S. Patent 5623433 (PDF) – Extended Numerical Keyboard with Structured Data-Entry Capability – J. H. Redin, 1997 (originally filed 1996), Usage of Verbal Numerals as a way to enter a number. U.S. Patent 4001566 (PDF) – Floating Point Calculator With RAM Shift Register - 1977 (originally filed GB Mar 1971, US Jul 1971), very early single chip calculator claim. All links retrieved December 24, 2016. 30th Anniversary of the Calculator—From Sharp's web presentation of its history; including a picture of the CS-10A desktop calculator. The Old Calculator Web Museum. The Museum of HP Calculators (slide rules/mech. section). MyCalcDB : 70s and 80s calculators database. Pico and General Instrument's Single Chip Calculator processor. Weapons of maths construction a novel pen-based calculator that will work on whiteboards or tablets. HEXelon Math calculator math calculator with units of measure and currency converter. GraphCalc – an Open Source graphing calculator program. Online math tool—powerful online mathematic calculator. This page was last modified on 24 December 2016, at 20:22.